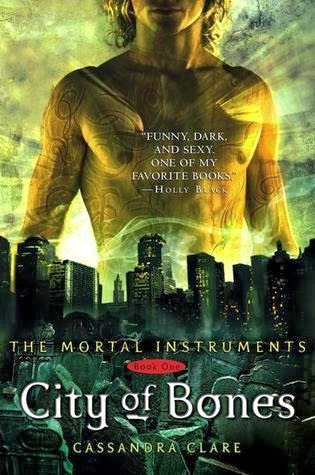 Summary from Goodreads: When fifteen-year-old Clary Fray heads out to the Pandemonium Club in New York City, she hardly expects to witness a murder -- much less a murder committed by three teenagers covered with strange tattoos and brandishing bizarre weapons. Then the body disappears into thin air. It's hard to call the police when the murderers are invisible to everyone else and when there is nothing―not even a smear of blood―to show that a boy has died. Or was he a boy? I finally decided that it was time to jump on the bandwagon and read The Mortal Instruments series. I'm not going to bother summarizing it, since I think I'm the last person on the planet to read this. Instead, I'll jump right in and tell you about what I did and didn't like. Writing style could use some work. I was surprised, based on the popularity of this series, to find that Clare's writing style wasn't as polished as I'm used to in traditionally published books. It wasn't bad - it just felt a little rough around the edges sometimes. There were times when the story dragged just a bit too. Still, I liked the overall story enough to overlook this for the most part and I'm hoping that the writing gets better in future books. Twists I saw coming. Okay, there were some pivotal twists in this book that I saw coming and I wasn't sure why the characters didn't see it too. There were still others that I didn't see coming (and one that I definitely didn't want to - eewww! - You know what I'm talking about if you've already read this book, although I have a distinct feeling that this twist is going to get untwisted in a future book and we'll find out it's not true - Don't tell me whether or not I'm right, though!). The characters. I definitely found myself connecting with the characters - While Clary wasn't the strongest or the smartest female heroine I've come across, I found myself rooting for her when things went bad (which was often) and I sympathized with her plight when she discovered that her whole life had been a lie. I'm hoping to see her grow in future books. I really liked Jace and definitely wanted to see him get past his idea that loving someone would just put them in danger. His inability to connect made his connection with Clary that much deeper for me. I also felt sorry for Simon, who pined after Clary throughout the book. I'm hoping that things work out for him in future books. The secondary characters were interesting to me too and I hope we get to learn even more about them! The ending. The ending of this book left me eager for more! I'm not exactly sure where Clare is going to take us in the next book, but she left me wanting more! So, I think that this was a good start to the series and I'm definitely eager to see where it all goes. While I don't think it was perfect, I'd say that, for me, the book is a solid 4/5 stars.